The Original Assignee is the name that appears on the document's official PDF. The Original Assignee is usually the applicant (but not always), and may or may not be the Current Assignee of the patent. Unlike the Current Assignee, the Original Assignee name never changes in our data (except for normalization). The field code is ANO (Assignee Normalized Original). The ANO field is normalized to fix misspellings, unnecessary long variants of the entity name, and creative punctuation (for example, "International Business Machines Corporation" would be normalized to "IBM"). ANO:LSI --> Finds documents where "LSI" is named on the patent or application. ANO:(Bose or Harman) --> Finds documents where either name is on the patent or application. ANC:(Apple Inc) NOT ANO:(Apple Inc) --> Finds documents that are currently owned by Apple but not originally owned by Apple. In other words, patents Apple has acquired! I then charted by Original Assignee (the applicant). 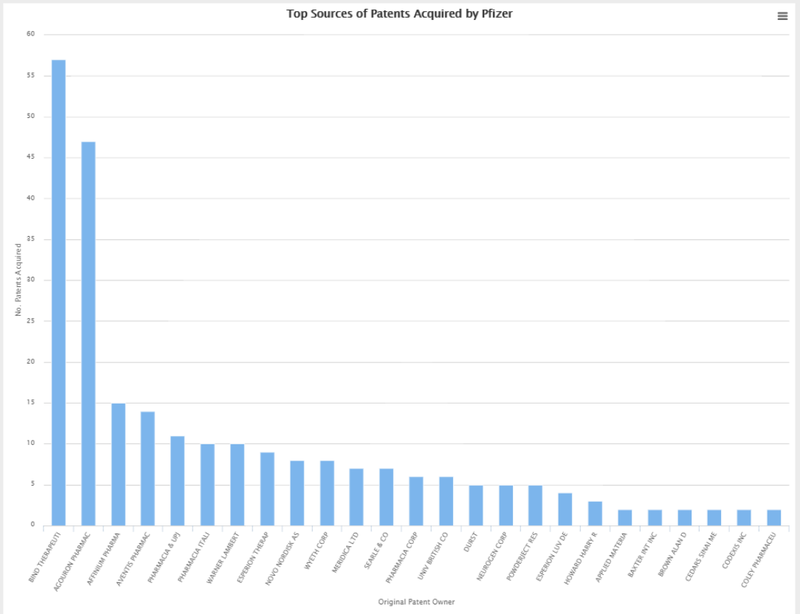 This shows us that Pfizer has acquired patents mainly from two sources, and almost as many from those two sources as the rest of the sources combined.